Well it is time for the 'Less is More' Challenge for this week and I found this quite hard to do even although it looks really simple. 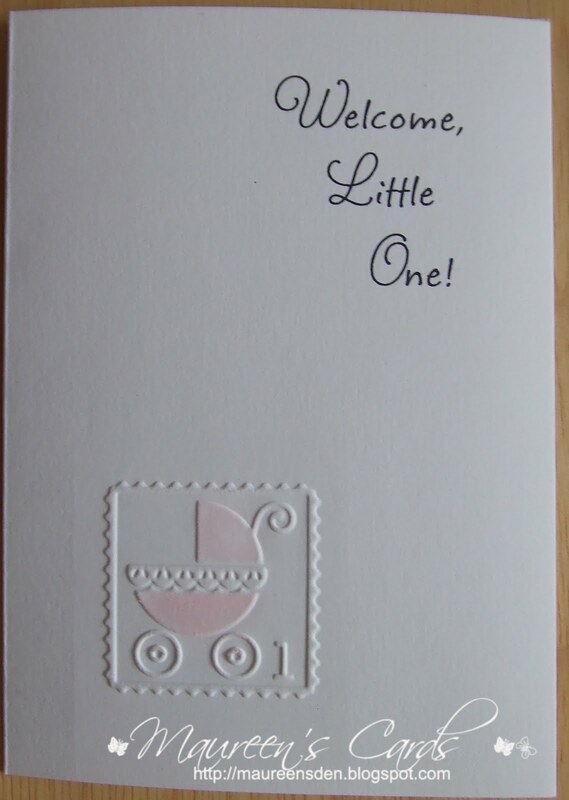 I printed the sentiment from the PC and used a cuttlebug folder for the little pram and shaded it pink with chalks. I hope this is okay for the challenge as I was really struggling. Thanks to Mandi & Chrissie for the great challenges every week. Pop over to their own blogs for a look and also to 'Simply Less is More' to join in the fun. This is a sweetie Maureen! ah this is sooo sweet. Hazel, it's so sweet!! I love the embossed carriage! Such a sweet card. I like the way you colored the embossed buggy. Cute card. The embossing was a brilliant touch! Hello Maureen.Beautiful, sweet and so elegant, i love your card, really good job. Pinks and Prams - love it - so simple and sweet. Darling baby card! Love the touch of pink.